The 60ml capacity of the Islande Shot Glasses makes them excellent for creating extra large shots. 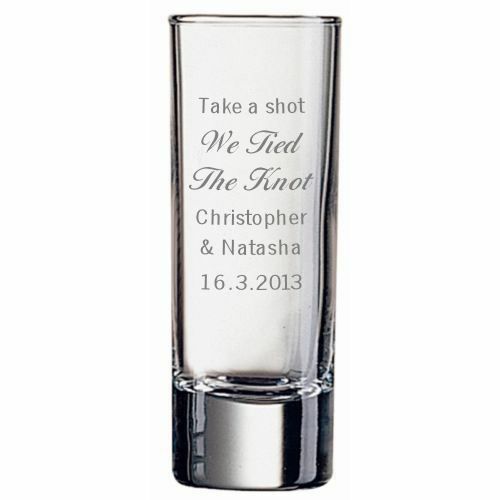 A perfect wedding favour for the adult guests at your wedding. A great cheeky keepsake to remember the day. The Islande Shot Glasses go against the usual shorter shot glass design and introduce the highball element to the world of shooters. Whatever your poison, the heavyweight design of the Islande Shot Glasses ensures they can withstand as much punishment as you can serve up! A lovely gift to give or receive, and to be cherished for many years to come. Let us know the names and date you require.